1. That the Under Sheriff of Gloucester Town to continue still in Office, as in London. 1. The Bill touching lading in Strangers Bottoms. 1. The Bill of Thomas Fyssher, Ar' against the Bishop of Coven' and Lychefeld. 1. The Bill for Assurance of Hartelbery, and Wychynforde, to Sir Francis Jobson and Walter Blount severally. 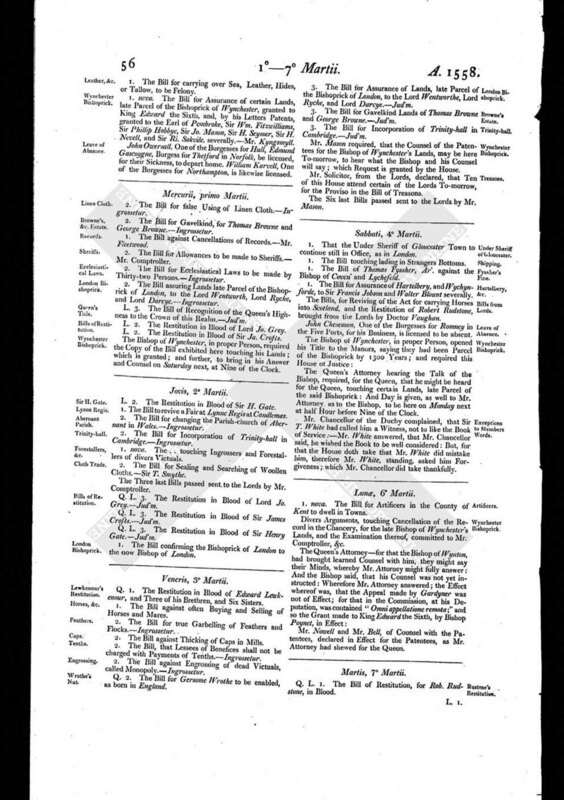 The Bills, for Reviving of the Act for carrying Horses into Scotland, and the Restitution of Robert Rudstone, brought from the Lords by Doctor Vaughan. John Cheseman, One of the Burgesses for Romney in the Five Ports, for his Business, is licensed to be absent. The Queen's Attorney hearing the Talk of the Bishop, required, for the Queen, that he might be heard for the Queen, touching certain Lands, late Parcel of the said Bishoprick : And Day is given, as well to Mr. Attorney as to the Bishop, to be here on Monday next at half Hour before Nine of the Clock. Mr. Chancellor of the Duchy complained, that Sir T. White had called him a Witness, not to like the Book of Service: - Mr. White answered, that Mr. Chancellor said, he wished the Book to be well considered : But for that the House doth take that Mr. White did mistake him, therefore Mr. White, standing, asked him Forgiveness; which Mr. Chancellor did take thankfully.